The screenshots in this guide are provided for illustration purposes only, as layouts and available functionality may vary as the result of customization. 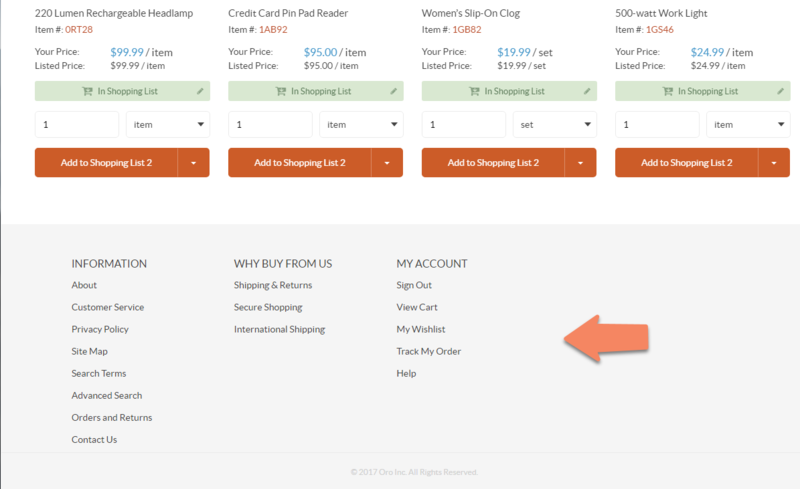 The key elements of the storefront menu are represented below. Links are placed at the top right of the page. Footer links are placed at the bottom of the page. You may find contact details of the assigned sales representative in the footer of the storefront page. The Sign In and Register buttons. The name of the signed in user, e.g. Signed in as: Amanda Cole. A link to the user account. The main menu is the key navigation bar that contains items for sale, important information, and shopping lists.